The 80’s continued | Fresh Vinyl HQ! In 1988, Bandai began to re-issue some of their previous Kaiju figures that were released in 1983 and 1984. King Ghidorah was released twice that year and Godzilla ’64 once. So, why re-issue these figures? Simple answer: the figures were selling well and Godzilla Vs. Biollante was in production. Bandai wanted to capitalize on selling figures with the release of a new Godzilla film. After all, tie ins are always a guarantee to sell with the release of a movie. 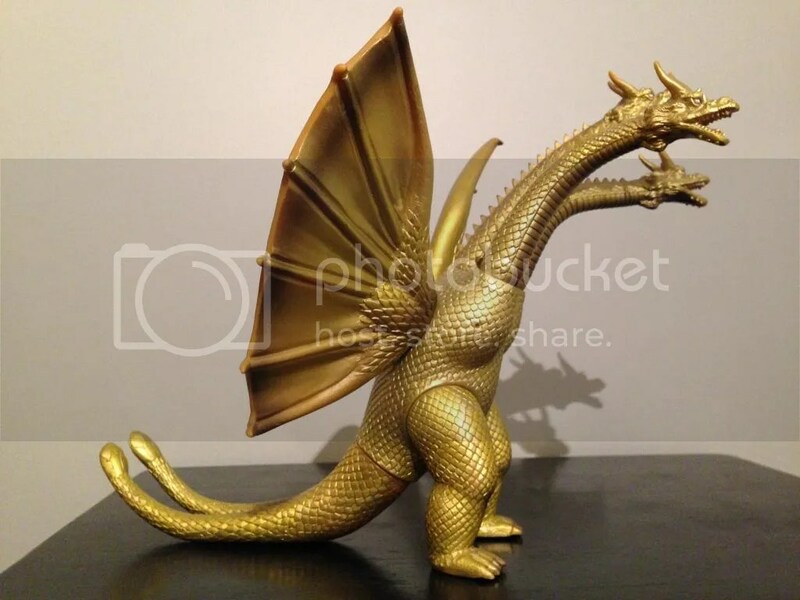 One problem: Bandai was not releasing a Godzilla ’89 or Biollante figure, not yet at least! 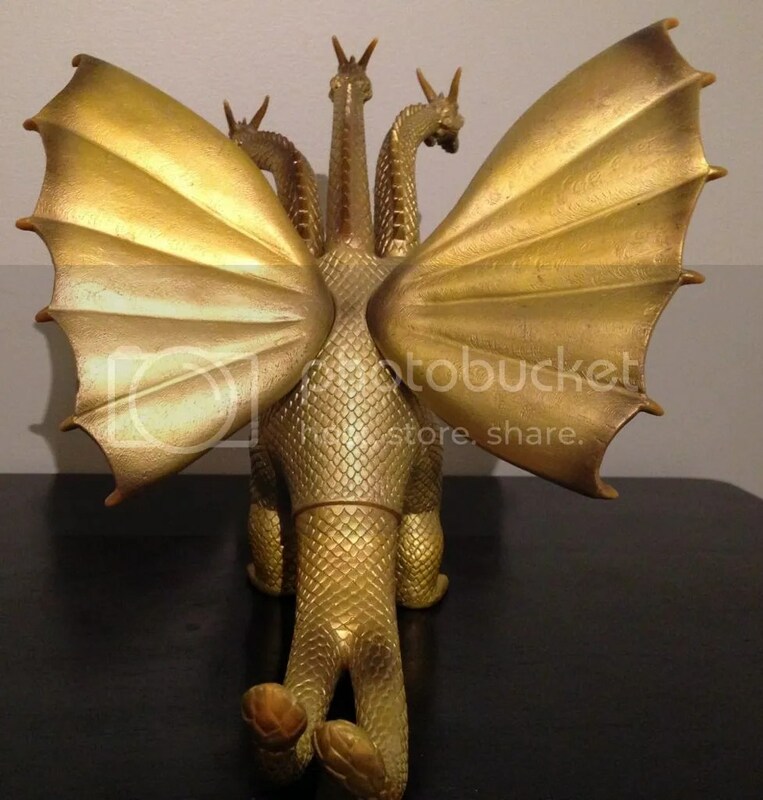 King Ghidorah was released in two variants, one in gold paint and the other in yellow/orange paint. Both figures came with hang tags that are near identical. 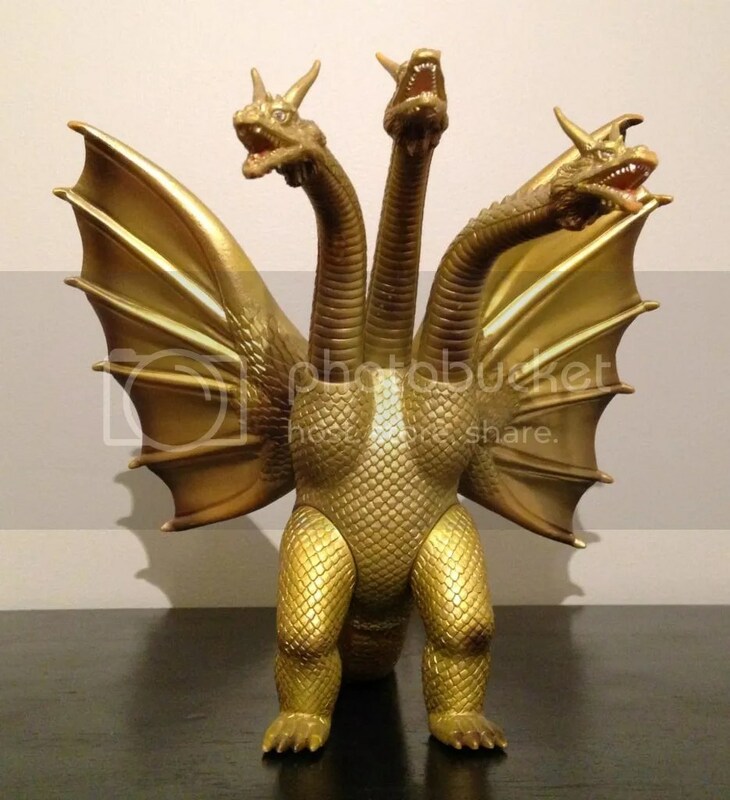 The sculpts are identical to the original 1984 release of King Ghidorah. The are some differences in the pain job. Can you spot them? The paint job on this 1988 reissue is very, very similar to it’s 1984 release. There is one difference here though. Did you spot it? Go back and look at the original ’84 mouths and then look at the mouths on ’88 re-issue. The mouths on all three heads here on the ’88 are not fully painted red, where as the ’84 had both the top and bottom of the mouths painted red. Bandai only highlighted the tongues on this release. This would follow suit for every other re-issue of this figure down the line. Other than that, the paint jobs are very similar. Same black highlights are represented on the legs, chest and tail, so not much different there. The feet have the same imprints on the bottom as the original. Even though the figure came out in 1988, the bottom of the foot still says 1984, signifying that Bandai used the same mold and sculpt for the reissues. With this reissue, the tag came attached to the figure. What you will see below is the tag detached. I have not reattached the tag yet. You can see in the right side of the chest is the tag hole where the plastic hangar went through. The tag for this figure is stylized much different this go around. 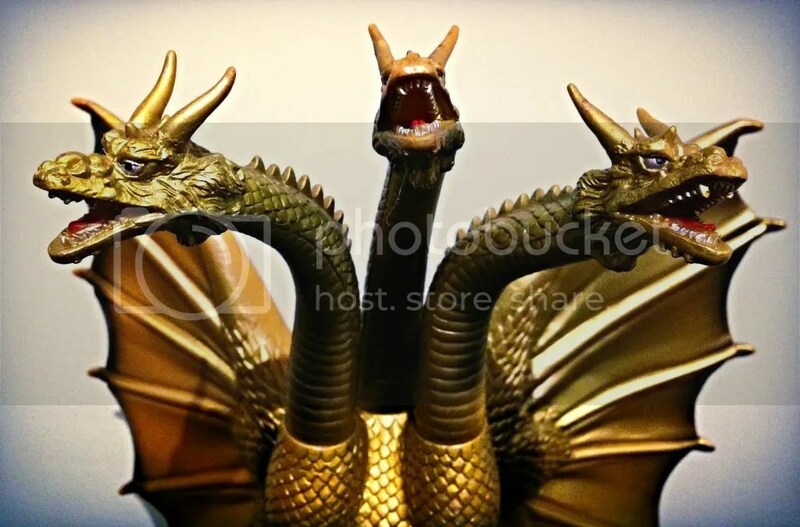 The image of King Ghidorah is from either two sources; the Japanese Lobby Card set from 1971 or a Turkish B1 poster from the 1960’s. I think the image is from the lobby card set. You can check out the movie posters and check for yourselves if you have Sean Linkenback’s book, The Art of Japanese Monsters, which features over 200 pages of Kaiju movie posters spanning sixty years. There is a gold Godzilla license sticker on the front of the tag, basic Toho Co. LTD markings in the top right and the year of printing and production in japan. The backside of the tag has King Ghidorah in Japanese, キングギドラ, along with basic Bandai info.